Foliage Restaurant is owned by Chef-patron and renowned forager, Chris Erasmus (previously chef at Pierneef at La Motte). This new restaurant gem is located in the heart of Franschhoek Village – the gourmet capital of South Africa. The setting of Foliage Restaurant, much like the menu, falls somewhere between upmarket bistro and contemporary farmhouse. 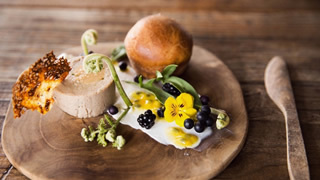 For Erasmus, foraged edible plants and mushrooms are an essential part of beautifying plates, flavouring stocks and reducing food costs on a small, seasonal menu rich in flavour. Much of that inspiration comes from Erasmus’ “field to fork” ethos. The backbone of the menu is what can be foraged from the surrounding hills and it’s a rare morning if you don’t find Chris, the patron of Foliage Restaurant, out there somewhere. At Foliage Restaurant, anything goes and we build the menu around what’s growing now, what’s available and we play around with that. Working for myself I get inspired by nature and what is fresh.